1. More Computers = More Storage: This point is obvious: the more computers you install AetherStore on the more storage you’ll be able to pool. You can install AetherStore on anything running Windows, from workstations to servers to laptops. Given the average workstation has over 350GB of unused storage, think about how much storage you can add by adding 10, 20, or even 50 more computers to your Store. If possible, the number of computers in your Store should be higher than your replication factor. That way, every computer does not have to store every data chunk, so you’re never limited to the size of the smallest computer in your Store. 2. Added Redundancy: Your replication factor can only ever be as high as the number of computers in your Store. For example, if you only include one computer, your replication factor cannot be any higher than 1x. AetherStore does not have another computer on which to replicate data. If that computer fails, the data in your AetherStore drive will be lost. (Hence why the Dashboard requires a minimum replication factor of 3x anytime at least three computers are discovered.) Conversely, if you install AetherStore on 20 computers, you can have a replication factor of anywhere between 3x and 20x! Many computers can be powered off or fail without affecting data availability. 3. Self-healing Design: One of AetherStore’s most unique and beneficial features is its self-healing design: in addition to replicating data across machines, AetherStore dynamically recopies data among active computers in your Store to maintain replication on the fly as computers leave and re-join the network. The more computers in your Store, the more locations AetherStore will have to recopy data on demand. Thus, you’re less likely to reach read-only Limited Replication mode during times where machine churn is high. 4. 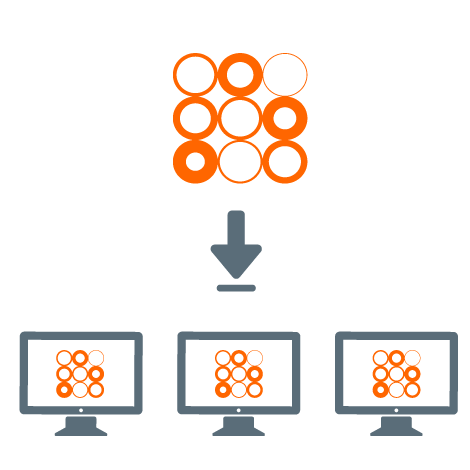 Drive Availability: AetherStore prioritizes data security and stability, so it will not allow you to write into the drive unless your specified replication factor can be achieved. For example: if you have 10 computers in your Store and 10x replication, only one computer needs to leave the network in order for AetherStore to enter Limited Replication (read-only) mode. Whereas if your replication factor is 4x in a 10-computer Store, several computers can be powered off before entering Limited Replicaiton mode. For greater drive availability, include a higher number of computers in your Store than your replication factor. 5. Resource Utilization: You already own the hardware, and there’s no change in cost in your AetherStore plan whether you want to add 20 more computers or 1,000. In summary, if you have computers with spare storage – why wouldn’t you include them in your Store? Where AetherStore is concerned, ‘the more, the merrier’ are words to live by! Start getting more out of your storage resources instantly by downloading AetherStore on your computers with available storage now. Whether you’re deploying your first Store or adding computers to an existing one- it’s a simple and FREE way to do more with what you have.